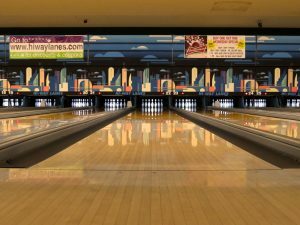 Hi-Way Lanes is a locally owned bowling center in the Franklin, serving all of Johnson County. Voted one of the cleanest bowling centers in Metro Indianapolis!! We are a totally smoke free facility and are extremely family friendly, with bumper gutters on all 28 lanes for the kids! Our mission is to provide affordable entertainment to the local community and be an active sponser of family events. Our most popular events are Birthday Parties (for both the youth and adults) and our Cosmic Bowling events which are held Friday and Saturday evenings. We also have Adult, Junior and Senior Leagues available. Please check our coupons page. We offer some great bowling discounts.